It took Rob & I all of about 2 minutes to decide to make this after searching through some similar Pinterest recipes on Sunday evening. This dish was so easy to put together and clean up was a breeze too. 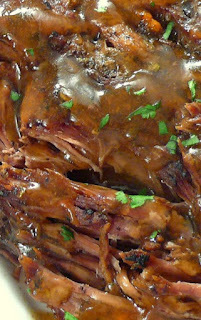 The leftovers the next day tasted great too…I must say, this is a new favorite of mine! I started out by seasoning the chicken thighs with pepper, onion powder, and garlic powder. Do you notice what I left out? Salt. You don’t really need it since the chicken will be baking in the chicken broth and even the less sodium broth has enough sodium. After I seasoned the chicken I turned the oven to 375, which gave me the perfect amount of time to whip up the sauce. I heated up about 2 cups of chicken broth and heavily seasoned it with minced garlic, the fresh dill, pepper, and onion powder. I let it simmer for a minute and added in juice from an entire lemon, and then 3 tablespoons of sour cream. It began to thicken the slightest bit, but not as much as we like it, so I slowly added in corn starch and whisked. I used about two teaspoons, probably a little less. It really just depends on how you like your sauces. After a quick taste-test the sauce was perfect, so I topped the chicken with fresh mushrooms in the baking dish, and then poured the sauce all over it. I popped it in the over for 25 minutes, I was so careful not to overcook it…so I did check on it a lot while I cleaned around the kitchen. Wild rice & a side salad make this easy meal complete. When I took it out, the smell was amazing, the scent of the lemon and the dill was so great through the apartment. 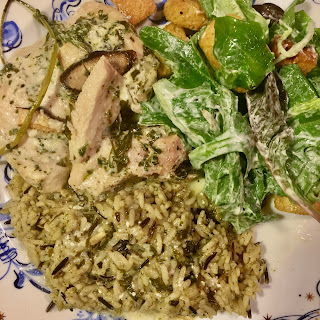 Not only was this dish super yummy, the clean up was ridiculously easy and quick, and making such a large serving allowed us both to take leftovers to work the next day. Also, overall it’s not an unhealthy dish as long as your substituting certain ingredients for their slightly healthier counterparts. Last weekend was a super cold one in D.C., so I thought it was best to make some insanely yummy comfort food before watching football. I was searching Pinterest for some new things to try, and I came across this recipe by Gimme Some Oven, that I used as a guide. This recipe was insanely easy to put together, I made the chicken while the pasta was boiling, & it took all of 10 minutes to whip up the Alfredo sauce. The end result was amazing, a nice & cheesy crisp on top after baking, and super cheesey and alfredo-y on the inside. If you don’t have the Trader Joe’s 21 Seasoning Salute, YOU NEED IT. I started by setting the oven to 350, getting the pasta water boiling, and pan cooking my chicken breasts. I used two, coated them in the spices above and cooked them through. It took about 12 minutes total. I made sure to add enough olive oil to prevent the chicken from drying out. After the chicken was cooked I placed it in a bowl and used the same pan to sautee the mushrooms and green onions. I added some more olive oil to the pan, and added in a ton of minced garlic. Once I had a nice garlic smell I added in the veggies. I didn’t cook them for too long, since I knew they’d cook a bit more once I put the ziti in the oven to bake. When the veggies were done I put them in the same bowl as the chicken, and made the Alfredo sauce. I added in the low-fat milk and chicken stock. Once that warmed up on a medium heat I added in some salt, pepper, garlic, & onion powder, and whisked in the flour. Keep whisking until you notice the sauce start to thicken, and then add in as much Parm as you please. It took maybe about 6 minutes for the sauce to thicken up. By the time the sauce was done the ziti was cooked and drained. I put the ziti, chicken, and veggies into my super cute brand new pink serving dish, and then poured the Alfredo sauce on top. I made sure to coat everything and just stirred it all up a few times. Now comes the exciting part, I put a entire bag of shredded mozzarella cheese on top. I always buy the part-skim kind so it doesn’t seem so bad calorie wise, don’t know if that’s 100% accurate or not, but whatever. I baked the ziti for about 15 minutes, until the cheese was melted and the sides looked a tad crispy. The finished product was AMAZING. Like, seriously, the best ever. Rob & I didn’t eat much of it Saturday night (we’re big cocktail hour appetizer folk), so we saved it for Sunday. The face of a pup who just wants some Baked Ziti in his life. 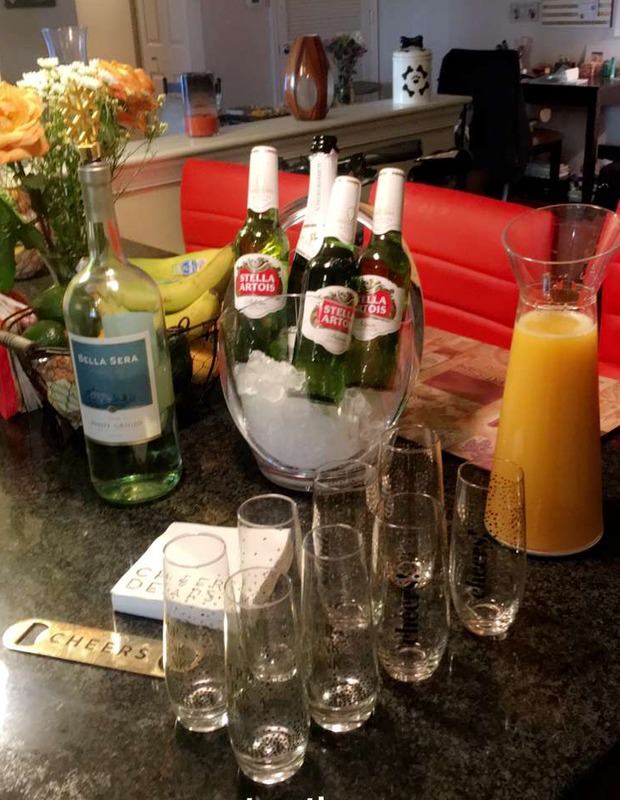 On Sunday I had a bunch of friends over for late afternoon mimosas & football. I drizzled the ziti with olive oil & popped it in the oven for about 15 minutes. It was gone within 10 minutes, so I’m thinking everyone enjoyed it! What everyones Sunday’s should look like, obviously. 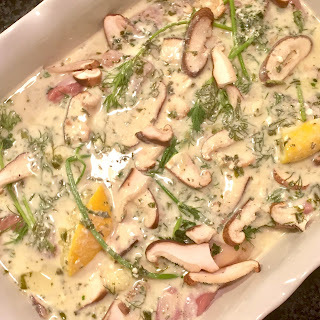 This recipe was super easy, and a great winter meal. Comfort food at its finest, but with some lighter ingredients! 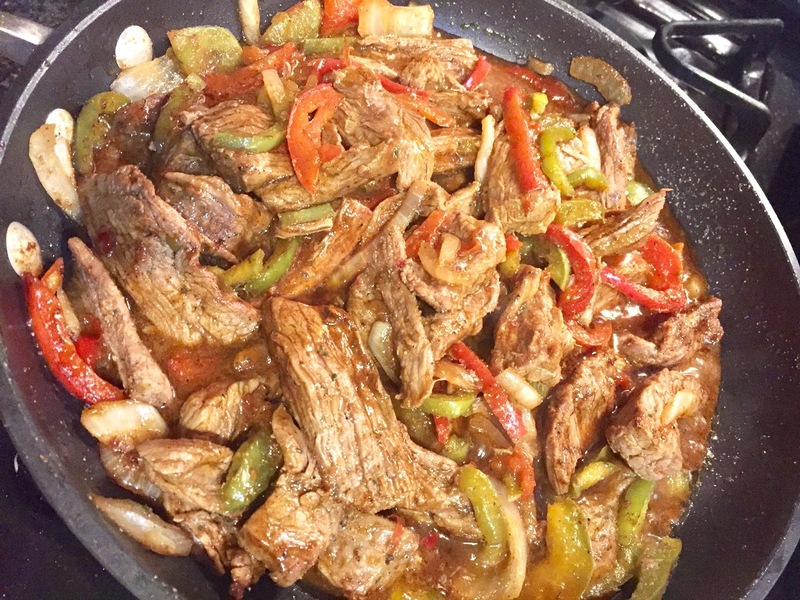 Ya know when you just need Taco Tuesday…except you realize it’s Monday and you’re craving steak fajitas?? Well, I know exactly what that feels like. I’m obsessed with steak fajitas…always have been…always will be. I started out with a flank steak and cut it up into strips. 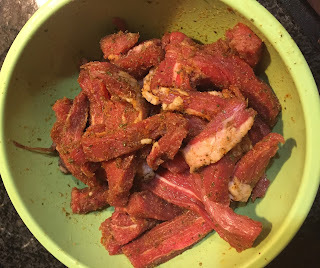 I had bought Ortega fajita seasoning, but I opted to go with my own mix to marinate the meat instead. 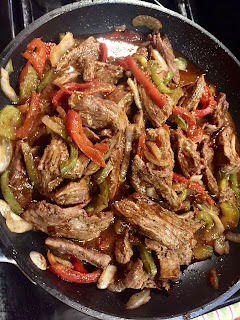 Throw together a nice mix of garlic powder, paprika, salt, pepper, cumin, chili powder, and cayenne (depending on how hot you want it) and you have an incredible fajita seasoning mix. I seasoned my steak, tossed it in a little olive oil, and let it marinate for about an hour before throwing it in a skillet. I added in minced garlic as I threw it on the skillet, and let the Mexican smells fill my kitchen. After most of the pink was gone from the steak I threw in sliced red & green peppers and onion. This took about 15 minutes total to cook up, so easy. I had flour tortillas in the oven for under 5 minutes and lettuce, tomato, cheese, sour cream, and guacamole on the counter to make your own. 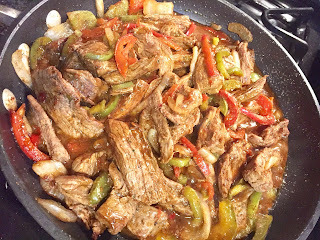 If you’re looking for a great weeknight meal, & want to switch up Taco Tuesday to Fajita Tuesday, then add this ridiculously easy recipe to your plan! Cranberry sauce…it’s a must have for any Thanksgiving table. Not only does it taste amazing, but the pop of color is perfectly fall-ish and delightful during Thanksgiving dinner. The key to the perfect cranberry sauce, in my opinion, is squeezing fresh orange juice, and adding just a hint of cinnamon as a bonus flavor. 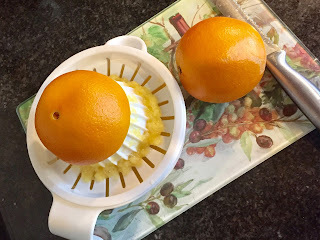 I start by juicing an orange and adding it to a pot along with the sugar and water. I heat it for about 3 minutes, and then add in the bag of cranberries. It takes about 15 minutes, stirring intermittently, for the cranberries to pop. As the sauce thickens add in the cinnamon. & you’re done! I like to put the cranberry sauce in a cylinder tupperware as a mold, but you can place in whatever type of serving dish you like. Place in the fridge until you’re ready to serve! Hint: I make sure about 95% of the cranberries are popped, but I like to have some that are only halfway there as well to add some texture to it. 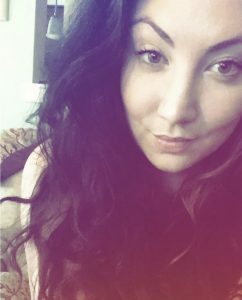 This weekend I was looking in the fridge for what to make, and saw some hamburgers, but realized I didn’t want to make hamburgers. SO, I pulled my new Rachel Ray Everyone is Italian on Sunday cook book and turned to the homemade meatball recipe & got to work! I rarely follow recipes to a tea, but I used this Rachel Ray recipe as a guide as to what to add to my own concoction. I had some Trader Joe’s Tuscan Bread, which is my all time fave, and I started crumbling 3 pieces up into a bowl. After that I mixed in an egg, chopped yellow onion, salt, pepper, parsley, garlic, and cayenne pepper for a slight heat. As you can see I mixed it into a ball below, and then used a spoon to make individual meatballs, and sprinkled flour over each before popping them into the over at 400 for about 15 minutes. I made some spaghetti, and used my favorite Trader Joe’s Tomato Basil Pasta Sauce. I typically make my own sauce, but this was an off night for me, so it was helpful to just grab this and use it for a quick meal! Even though it’s still quite warm in D.C. I’m totally in the mood for fall, and I cannot wait to cook some great new things with the change in season. I’ve been searching all over the web for some new, out of the box, recipes to try & I’m sharing them here, with you today! Fall screams soup to me, and I personally love having soup & salad for dinner with some nice fresh bread. This One-Pot Tomato and Basil Tortellini Soup, created by Gal on a Mission, looks so delish, and I can switch out store bought tomato sauce for my homemade one. 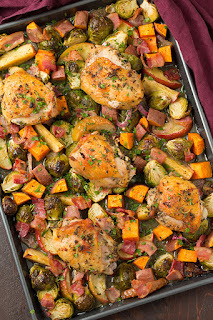 Cooking Classy’s One Pan Autumn Chicken Dinner sounds too good and easy to be true, I love it! Being able to throw all of those yummy things onto a pan, and into the oven, only to have it come out looking so incredible, is a perfect ending to a mid-week work day. The flavors of Brussel sprouts, apples, and bacon, would taste amazing. Such a quick & flavorful fall dinner. 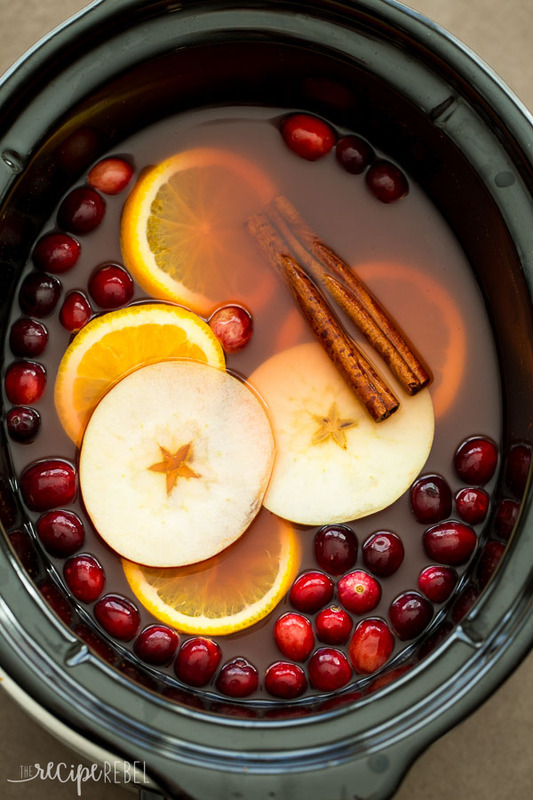 A little drink addition for Football Sunday, the Recipe Rebel’s Slow Cooker Cranberry Apple Cider would be incredible spiked while watching the football games, or having friends over on a Saturday night. I can only imagine what my apartment would smell like with the cinnamon and ground cloves slow cooked for 3+ hours. Cocinando Con Alena’s Slow Cooker Pot Roast is described as “melt in your mouth”, which makes me want to run to Trader Joes and buy a pot roast right now. 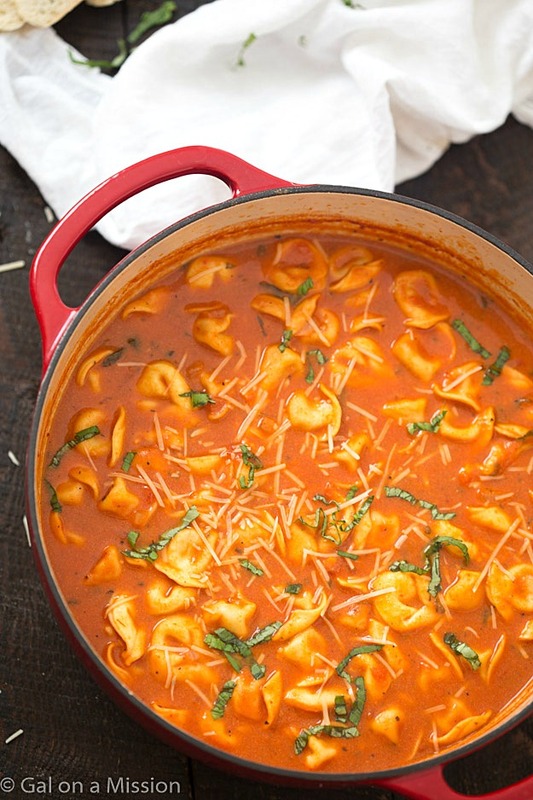 I can also see myself making this on Football Sunday…guess I need two slow cookers! I would love to just sit and eat The Night Owl’s Pumpkin Pie Cheesecake Dip while drinking a nice glass of wine… on a Tuesday night. Ya know, when you feel like it should already be Friday! Serving these with graham crackers and fruit…AH, so yum. This veggie orzo salad is perfect to whip up on a lazy & hot Sunday afternoon, it’ll be perfectly chilled for dinner time & perfect for leftovers all week! If it even makes it past 2 days, it’s so good! 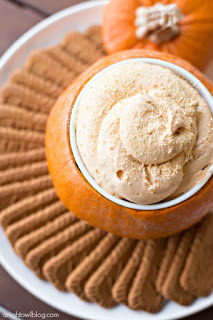 I originally saw this recipe over on Two Peas & Their Pod, a recipe blog I love. I loved the idea, was bored, had all the ingredients, and was ready to go. Being that I love love love flavor and all types of fun additions, I made my own version of this salad and it was outstanding! -Place all the above in a big bowl and set in the fridge while you make the dressing! Okay so once again, just a disclaimer, I don’t measure anything ever. However, with this salad, you need a lot of dressing to coat it all, just an FYI. Mix olive oil and balsamic vinegar for the base of the dressing. Experiment with the amount of balsamic vinegar you’d like by adding it little by little. Next, add the key four ingredients to make this salad taste like woah. Again, add them little by little to see how you like the taste & continue to build up the flavor to your liking. 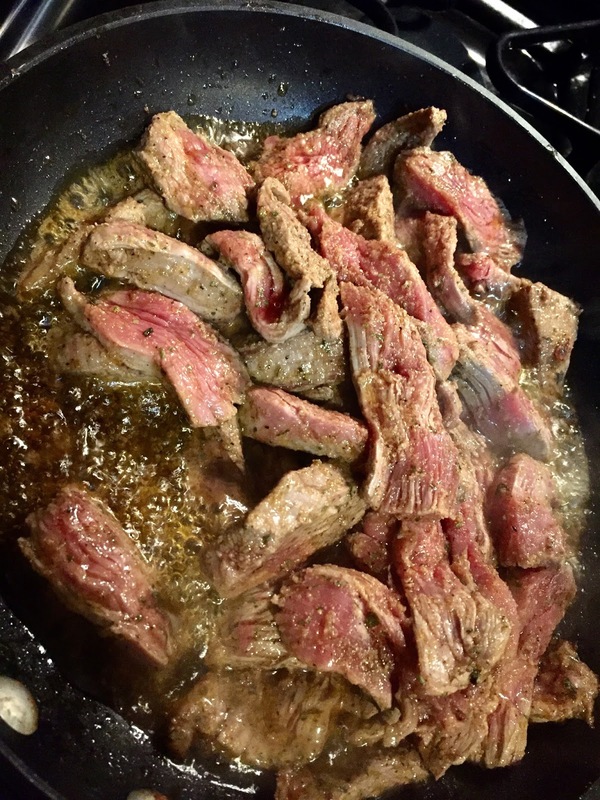 Add salt/ pepper, however much you like…I tend to OD on fresh ground pepper. Next, mix the dressing in with the orzo/ veggie mixture you placed in the fridge. Add in a ton of feta after you initially coat the orzo/veggies. Lastly, drizzle with lemon juice for an extra pop. As I said, this salad is ideal for a hot summer day. The leftovers will be good for days, so make a big batch just to have around! Coffee is my AM lifeline each and every morning, it’s an integral part of my morning routine. Coffee perks me up, coffee keeps me going, coffee is delicious, and coffee makes me smile. 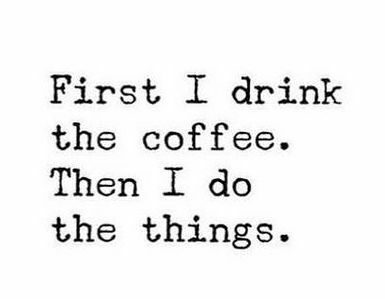 As a teacher coffee will give you a little boost at any point in the day. It’s always there for you, doing its best to help keep your eyes open when you just want to snooze. Coffee is also, sometimes, kinda expensive, if you’re like me and love cold brew or even more expensive, yet extremely delicious, nitro cold brew. In an effort to save money for more important things in life, like brunch and my Roth IRA, I decided to start making my cold brew at home! 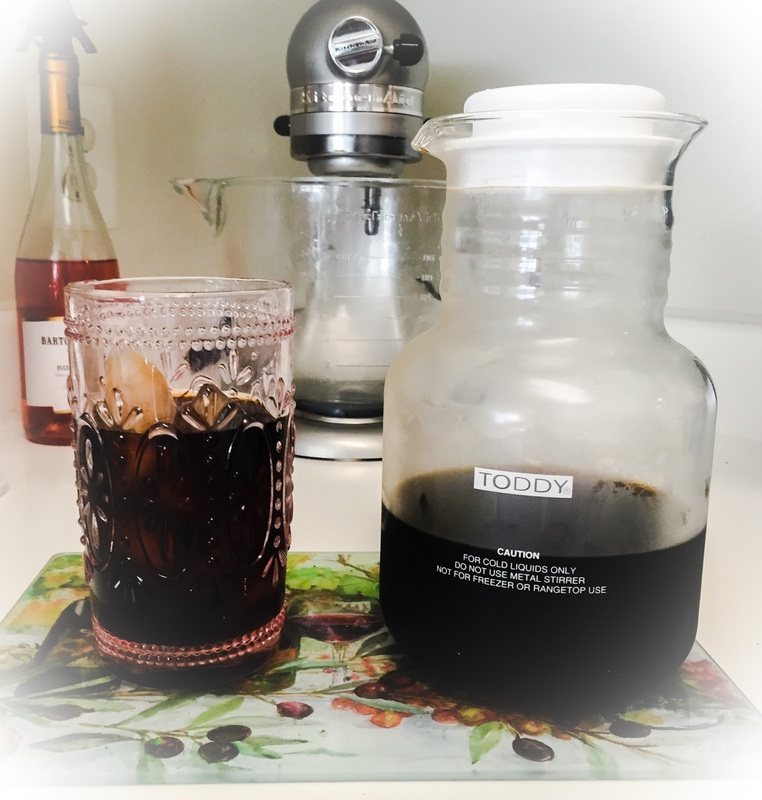 I researched some at home cold brew kits, and I came across the highly rated Toddy Coffee Maker. The price was perfect, and with an added coupon & Ebates I couldn’t resist purchasing it and giving it a try. 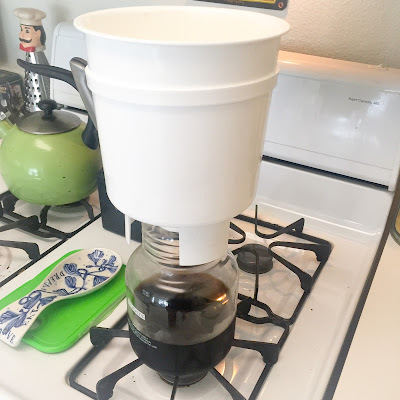 I’m well aware you can make cold brew without something like this, but the Toddy makes the process so easy and clean up a breeze, so it’s well worth the money for me. The Toddy comes with a glass carafe, brewing container, 2 filters, and a small rubber stopper for the brewing container. For my first go at this I tried a bag of Vanilla Creme Brulee coffee I purchased while in Hawaii. Following the Toddy directions are super simple, you basically just layer water and coffee in the amounts they tell you too. One super important tip…use filtered water!! It truly does help with the taste!! The filter at the bottom of the Toddy will help to reduce the acidity and bitterness that can easily happen when making your own cold brew at home, and allows for a rich and tasty coffee concentrate. I left my Toddy out at room temperature to brew for about 20 hours, then I moved the brewing container on top of the carafe, released the small stopper, and voilà I had an incredible batch of strong cold brew! When I made my first cup of cold brew I only added in some almond milk and ice and it was a little bit too strong, so I just added some more filtered water..if you’ve ever noticed they always use a bit of water at Starbucks for their cold brew. After adding just a bit of additional water it tasted absolutely delicious. The cold brew concentrate lasts 2 weeks, although with two people drinking it each morning, mine lasted about one week. It does use lot of coffee, one batch is almost a full bag, so I stocked up on Target Cartwheel coupons for Dunkin Donuts coffee. If you don’t know what the Cartwheel app is def check it out & start saving $$! A venti cold brew, what I typically order from Starbucks, is about $3, so I don’t mind spending $6 on a bag of coffee for a weeks worth of cold brew, versus ordering a Starbucks 3x a week! 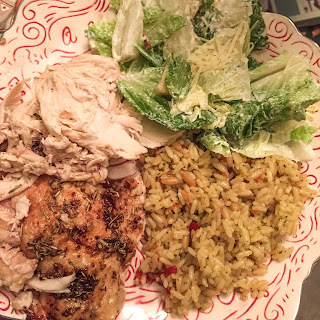 This Recipe Wednesday is a remake of RecipeTin Eats’, One Pot Greek Chicken & Lemon Rice. This was so incredibly easy to whip up on a Saturday night, and it caused my apartment to smell amazingggggg! 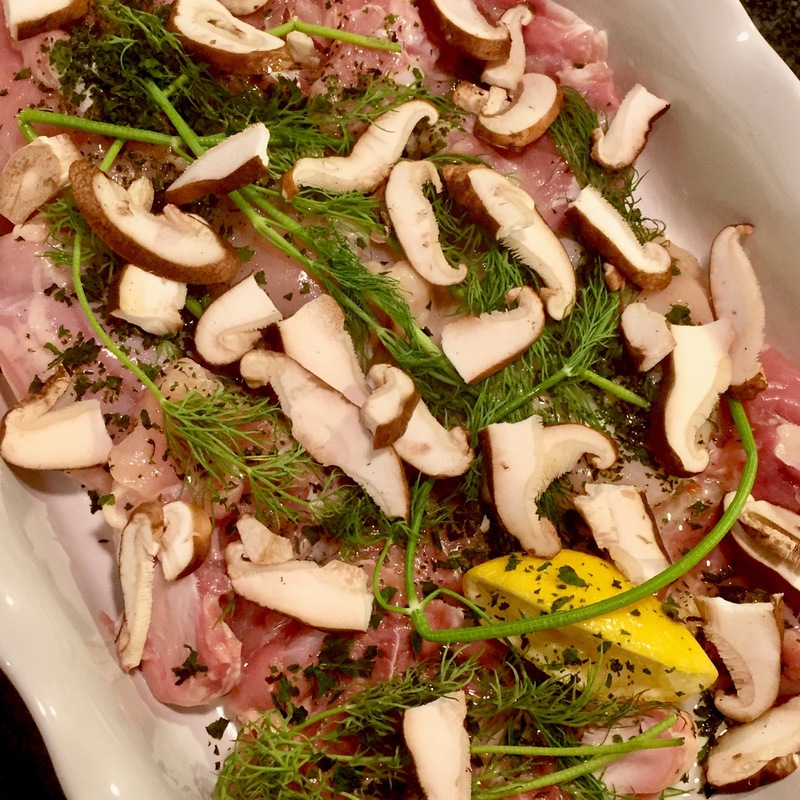 The original recipe calls for skin on chicken thighs, and that probably would have been the better option, but I went with boneless chicken breasts because that’s always my go to. I started by preheating my oven to 350 degrees and seasoning the chicken with sea salt, pepper, fresh lemon juice, and garlic powder. I then cooked the chicken on a high heat in a little bit of olive oil for about 2 minutes on each side until they were nice and golden, since the breasts were thick I wasn’t worried about them cooking too much. I then removed them from the heat and let them rest on a plate while I prepped the rice. First, I chopped & sautéed a yellow onion in some garlic and olive oil. Next, I always use Near East rice and I had a Wild Rice box, so I used that. In the same deep skillet I had had the chicken in I poured 1 3/4 cups of chicken broth, the rice, and the seasoning packet. I let it some to a nice simmer, then I removed it from the heat, added in that chicken, squeezed the rest of the lemon over it, covered & placed it into the oven for 35 minutes. Within 10 minutes my apartment smelled delish. After regularly basting the chicken, 35 minutes later I took off the top and noticed just a tiny bit of liquid left for the rice to absorb. I left the lid off and cooked for just about 5 more minutes. When I took it out it looked, and obviously smelled, delicious. I had never made a roast chicken before, so I figured this past Sunday would be the perfect day to take the time to season, and slow roast, my first chicken! I started by seasoning the inside with salt, pepper, and then stuffing it with lemon wedges and a cut up yellow onion. Next, I created a garlic, pepper, & lemon butter, slowly lifted the skin of the bird, and carefully placed the butter underneath. It was super easy to make the butter, all I did was take 4 tablespoons of soft salted butter, and added in a ton of minced garlic, black pepper, and half of a lemon’s juice, mixed it up and bam you’re done. Having butter underneath the skin helps the skin become super crispy when roasting. After placing the butter under the skin I seasoned both sides of the chicken with salt, lemon pepper, minced garlic, black pepper, lemon, rosemary, and olive oil. The last thing anybody wants is dry chicken, so I made sure to use plenty of olive oil all over it to keep it nice and moist while roasting. I popped the chicken in the oven at 425 degrees, and relaxed for about 25 minutes before taking it out, basting it, and turning it over. I did this again 3 more times, to ensure even cooking and to make sure I was doing enough basting. I also poured about a cup of white wine over the chicken for the last 25 minute round, ya know, just for fun. It was easy enough to continually turn the chicken over because it was so small…I realize that if it was a bit bigger it would’ve been harder to do that! 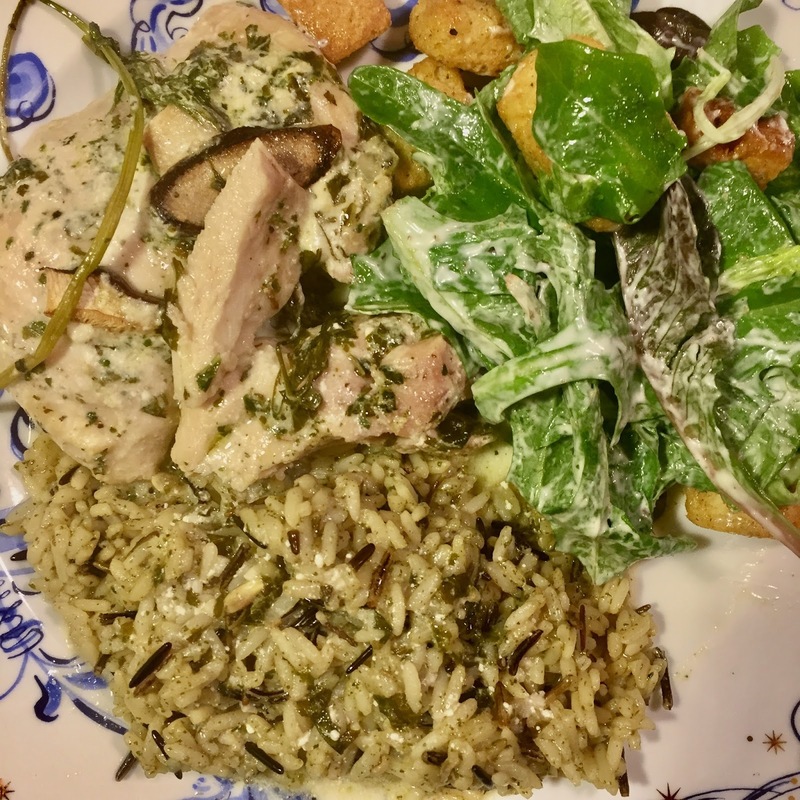 I was inspired to make a roast chicken, and adding the wine, after reading The Foodie Crush’s Oven Roasted Chicken with Lemon Rosemary Garlic Butter.